Facelift Washington DC | Rhytidectomy D.C.
As we get older, skin and soft tissue throughout our body begins to lose elasticity causing the neck and lower jaw to begin to sag and droop. This is a natural process that occurs in everyone, but can vary depending on genetic and environmental factors such as sun exposure and how the facial skin has been cared for over the years.The facelift, or rhytidectomy, is a procedure performed to reverse the effects of aging, and restore a more youthful, fresh facial appearance. Delivering arguably the top facelift DC has to offer, Dr. Christopher C. Chang restores the clean lines of the jaw and neck associated with a youthful appearance and turns back the hands of time. Fatty deposits on the lower face that have created a “jowly” look. In fact, the neck and lower jaw are often the first area of the face to begin to show the signs of aging. The neck skin is fine and somewhat fragile, and the loss of collagen causes it to wrinkle or sag, often early in life. Heredity plays a role in how your face and neck will age, but typically the sag begins to appear in the late 30’s or early 40’s. Often called “turkey neck” or “wattles,” the condition can be distressing, embarrassing, and greatly impact your overall feelings of wellbeing. As one of the best providers of the facelift Washington DC has to offer, Dr. Chang uses this procedure to tighten loose and wrinkled neck skin and give you the firm, healthy look of your younger years. As the facial skin ages, the tissue loses elasticity, and gravity begins to have a greater effect. This results in jowls that sag over the jawline. Heavy jowls can add years to the appearance of the face, and many patients find themselves pushing their cheeks upward in the mirror. 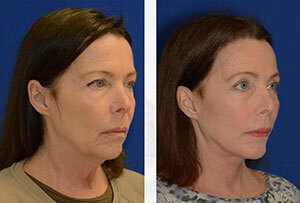 Lower facelift surgery can restore the clean jaw line of your younger years, with the jowly look completely resolved. The procedure that will work best for your case can only be determined through a full evaluation of your facial skin, the condition of the facial tissue, and a comprehensive review of your medical history. Every person has a unique condition, and Dr. Chang will determine a specific plan based on your features and goals. Youth and beauty have long been synonymous in cultures across the world, and throughout history. In many societies, aristocrats could be recognized by their smooth, fair skin, which was not aged and darkened by the sun as with laborers and farmers. These themes still persist today, although the emergence of Hollywood and tanning in the 50’s, 60’s and 70’s brought sun-kissed skin into fashion. Today, personal health, environmental awareness and physical fitness have become priorities in our culture. While the baby boomer population is growing older, this group is also healthier and more active than earlier generations in their later years. These patients want to look as young as they feel, but sun exposure in the younger days, as well as outdoor living have often taken a toll. For these patients, facial rejuvenation and advanced procedures to reverse the signs of aging have increased in popularity. Facelifts has been performed for centuries, but in the mid-20th century the most current facelift procedures developed. Previously, the skin was tightened by pulling upward and back, re-draping the cheeks and eyes giving an odd, unnatural “windswept” appearance. Often, even these effects were short-lived, as the skin and tissue once again loosened with the aging process. In the 1970’s Swedish plastic surgeon Tord Skoog popularized his version of the procedure. In combination with other plastic surgeons Mitz and Peyronie, Skoog helped to define the concept of the deeper layers of the face – known as the Submuscular Aponeurotic System, or SMAS. Using this deep tissue, Skoog created a procedure that supported the tightened skin, providing a more thorough correction of sagging, loosened tissues. During the plastic surgery boom of the 70’s, 80’s, and 90’s SMAS lifts became the standard method, by tightening or removing portions of the deep tissue of the cheek to restore the facial profile associated with youth. In the late 90’s, Lemmon and Hamra popularized a new type of lift, called a deep-plane or composite lift, which kept the SMAS layer and skin layer together, strengthening the power and hold of the re-suspension to the overlying skin. 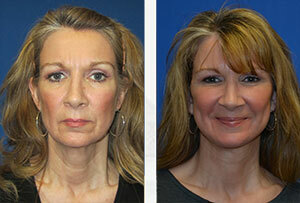 Today, variations of subcutaneous, deep plane, SMAS, and “high” SMAS facelifts are all performed routinely. These may be effective as a single procedure, or are part of a treatment combining implants, fillers or fat grafting. Dr. Chang will review all the options for facelifts, facial rejuvenation, necklifts, and eyelid and brow tightening to determine the most effective treatment plan for the individual patient. Dr. Chang is an authority in the field of facial plastic surgery. With extensive training in facial cosmetic surgery, he has performed nearly every type of facelift including subcutaneous, SMAS, SMAS plicaton (a medical term for “fold), high SMAS, deep plane, and MACS (thread) lifting. He is the only plastic surgeon in the DC area that has completed an ACGME-accredited craniofacial plastic surgery fellowship. Furthermore, he has worked directly with some of the experts and innovators of these techniques to advance his knowledge and skill in the most modern procedures for facial rejuvenation. With all these things in mind, it is easy to see why Dr. Chang's patients regard him as one of the top providers of the face lift Washington DC have to offer. Many patients express apprehension when they hear the word “facelift.” Although everyone notices laxity and drooping facial skin, there is typically a concern about the results of a facelift “looking too tight” or “overdone.” Many tabloid magazines and celebrities have perpetuated this fear, by popularizing images of over-tightened, over-injected A-listers. Dr. Chang prides himself on producing natural-looking results, with a conservative, yet effective approach to produce appealing outcomes. To avoid the windswept appearance, every procedure is carefully planned, with a full examination of the facial structure, quality and strength of tissue, and a complete understanding of what the individual envisions in results. A detailed history of skin treatments, medical conditions, and prior surgeries is an essential aspect of the consultation, as repeated tightening procedures over the years can contribute to a “pulled” appearance. During your complimentary consultation, we can review every concern and explain how a natural, more youthful, fresh appearance can be achieved. Recent studies have confirmed that the effects of a full facelift can make patients look an average of ten years younger. There are many different types of facelift depending on the issues and areas of the face that you wish to have addressed. This could be a mini-lift, a brow lift or a full face lift. What are the Techniques Used for a Facelift? The primary techniques are the SMAS (Submuscular Aponeurotic system) lift or the deep-plane lift (also known as the composite lift). Both target subcutaneous tissue layers to increase the longevity of the results of a facelift and prevent the skin from looking unnatural or pulled. Yes, to help you acquire your desired results other procedures can be used simultaneously with a facelift. This could include implants, fat grafting, liposuction, and fillers. A facelift can take years off your appearance by reducing wrinkles, sagging jowls, as well as tightening the restoring a youthful definition to the jawline and neck. If you are unhappy with what you see in the mirror or you are uncomfortable or embarrassed by sagging skin, drooping jowls, and facial wrinkles, and would like a refreshed and rejuvenated look then a facelift could be right for you. Should I Anticipate Any Scarring from a Facelift? Scarring is minimal and made to be as invisible as possible. Incisions are mostly made in the creases around the ears or behind the hairline and are quite small, leaving the face with a fresh and untouched look. The recovery time on a facelift is approximately 3-4 weeks. Incisions should heal and any bruising or swelling should greatly reduce during that time. What Should I Expect During the First Week Post-Surgery? There will be some swelling and bruising around the incision sites and areas affected by the procedure. Expect to keep your activity low during this time. In some cases, the results of a facelift are immediately visible. This is dependent on the scale of work done. Minor procedures may take time to fully appreciate due to swelling and bruising around the surgical site. Full results from any facelift can typically be expected to improve as the months pass, up to six months after the procedure. The longevity of the results from a facelift depend on the extent of the procedure as well as individual genetics and lifestyle. A mini-lift may last for 2 to 5 years where a more invasive procedure like a full facelift could last up to 15 years. Will My Face Look Frozen or Pulled After a Facelift? Not with the modern techniques available in the hands of an experienced surgeon. The crucial aspect here is choosing a surgeon that specializes in craniofacial and cosmetic surgery, this way you can be confident in obtaining natural and untouched looking results. Dr. Chang has extensive and advanced training in craniofacial and cosmetic surgery and specializes in these areas. His expertise and experience in the field of cosmetic surgery will leave you confident in his abilities. On your initial consultation he will develop the optimal solution for your needs. Financing is available, options to best serve your needs can be discussed with our office. It is not a technique that produces the outcome – it is the surgeon and the individual patient. Many surgeons can achieve excellent results by different facelift methods. It is important that you choose a plastic surgeon capable of producing a result that meets your unique expectations. Dr. Chang can assist with defining your goals, and guide you to come to an informed decision by explaining your various options for procedures to reverse the signs of aging. Your treatment plan is customized to address your individual condition. If you believe that the rest of your face is fine, and merely the jowls that have begun to sag should be resolved, the treatment may involve what is termed a “mini facelift.” Those with more extreme cases of jowly, saggy skin, may require a more extensive procedure. It is reassuring to know that your procedure will be performed by a plastic surgeon who is highly familiar with all types of face and necklift surgeries, and who will perform a thorough evaluation to select the procedure that will produce the result you envision. Not only does Dr. Chang have an impressive breadth of knowledge and skill in the various procedures that can restore the look of youth to the face and neck, he performs facelift surgeries with an uncommon level of artistry. This is evidenced by his detail in incision pattern, hair preservation, hidden scarring and precision suturing. Producing a more youthful appearance that appears fresh and natural not only improves your appearance, it changes how you feel about yourself; the restored self-confidence is often dramatic. If you are unhappy with the face reflected in the mirror and the aging, tired appearance of sagging facial skin, you are likely a candidate for a facelift. At our practice, our goal is to identify the correct procedures that will make you look as young as you feel. Modern cosmetic surgery techniques provide patients with an advantage, in that they are less invasive and create a more beautiful result. Take the time to find out more about a facelift in a complimentary consultation with our expert cosmetic team. A facelift is a surgical procedure that Dr. Chang performs to rejuvenate and restore a more youthful appearance to the face. Wrinkles, sun damage, and loose skin can make a person appear tired, old or even angry. Most patients who come to our office are good candidates for a facelift, but only a full interview and a review of your medical history can reveal what procedure will be best for you. Dr. Chang is exceptionally familiar with the range of facelift procedures, including the mini lift, skin lift, SMAS lift, short scar lift, high SMAS lift, deep plane lift, and MACS lift. Get guidance from a true professional in the field of facial surgery – you deserve it. 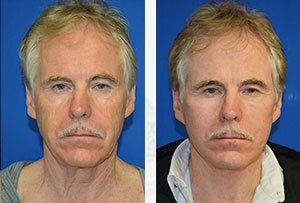 Schedule your complimentary consultation with one of the top facelift providers in Washington DC. Dr. Chang's offices are conveniently located in two locations just outside Washington DC. Dr. Chang has co-authored authoritative papers on the topic of fat grafting, resulting from his collaboration in New York with Dr. Sydney Coleman, the NY Times “King of Fat." Schedule your complimentary consultation today. Dr. Chang's offices are conveniently located in two locations just outside Washington, DC.